At the Echo Nest we have lots of data about millions of artists. It can be interesting to see what kind of patterns can be extracted from this data. Tim G suggested an experiment where we see if we can find artists that are on the verge of breaking out by looking at some of this data. I tried a simple experiment to see what we could find. I started with two pieces of data for each artist. 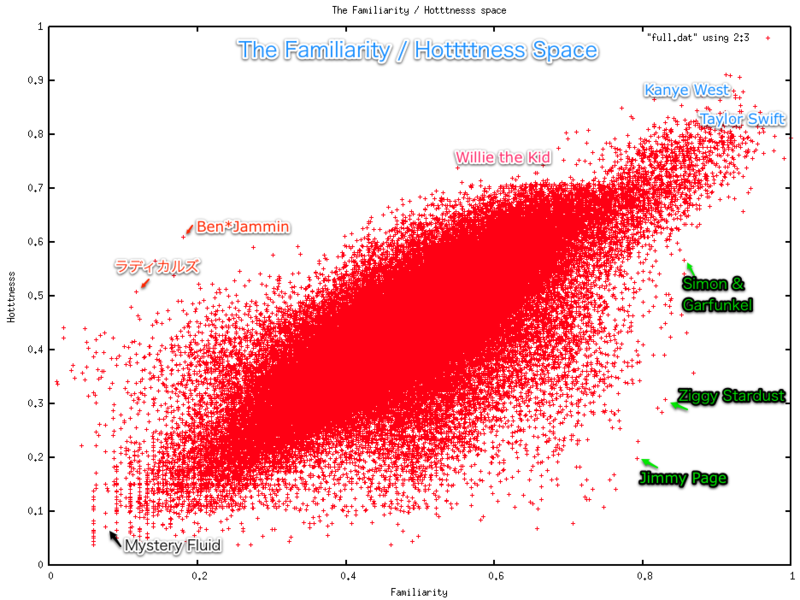 Familiarity – this corresponds to how well known in artist is. You can look at familiarity as the likelihood that any person selected at random will have heard of the artist. Beatles have a familiarity close to 1, while a band like ‘Hot Rod Shopping Cart’ has a familiarity close to zero. Hotttnesss – this corresponds to how much buzz the artist is getting right now. This is derived from many sources, including mentions on the web, mentions in music blogs, music reviews, play counts, etc. Lord Vampyr’s Shadowsreign – 32 Last.fm listeners – I’m not sure whether they are being serious or not in this video. This entry was posted on December 9, 2009, 12:09 pm and is filed under code, data, Music, The Echo Nest. You can follow any responses to this entry through RSS 2.0. Both comments and pings are currently closed. Perhaps the two sides of this graph should form the input into outlierFM’s upcoming 24/7 radio…interested in getting me a data stream? hey good post! I’m just curious about how the familiarity is determined for each artist? what paul doesn’t say because he thinks most people already know is that both familiarity and hotttnesss are available for free in the Echo Nest API available on http://developer.echonest.com/ once you register for a key. Thanks brian. I know that information is available in the api. What I wonder is how it is calculated because the api seems expose no details about it. 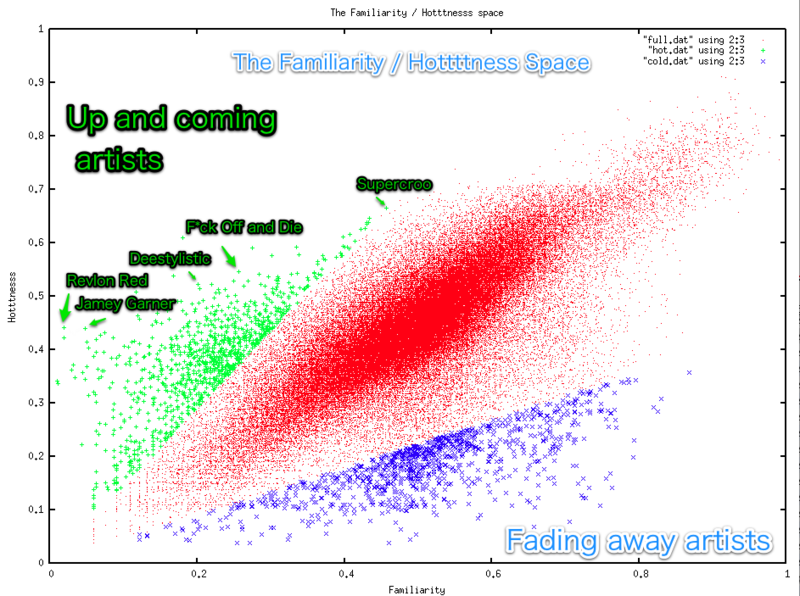 The way how it be measured may reveal the correlation with hotness. or did I miss sth in the EchoNest doc? Dean: We don’t publish the exact details of how we determine familiarity or hotttnesss – we are constantly refining our algorithms and sources – but some major components for familiarity is overall playcounts (from numerous music sites), sales rank, chart appearances and appearance on the web. Paul, appreciate for the information. So the familiarity seems like kind of long-term hotness.